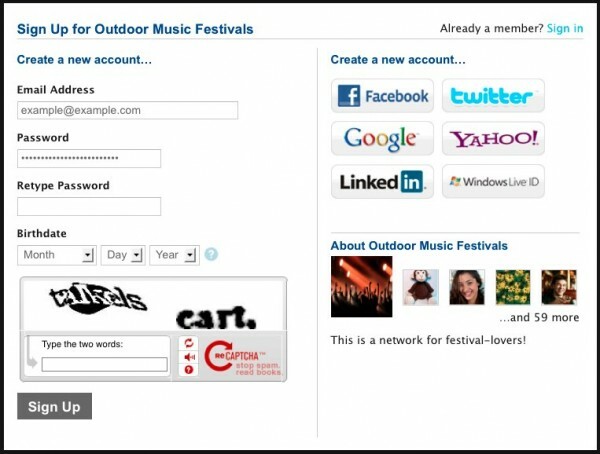 Enabling Social Sign In for LinkedIn allows people to sign up and sign in using their LinkedIn accounts rather than an email address. To get started, you’ll first need to create a LinkedIn app. It takes about 2 minutes to set up. Head to your account on LinkedIn, then go to the LinkedIn Developer Network at https://www.linkedin.com/secure/developer and click “Add New Application”. You’ll be taken to an application form. 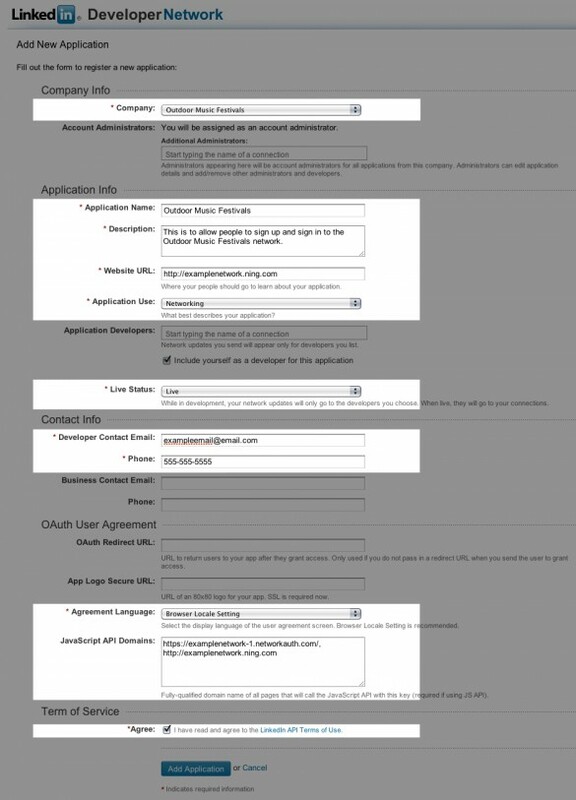 For the Company, Application Name and Description fields, you can enter whatever information best suits your network. Enter your network’s URL in this field. Â Please note that if you have a domain-mapped network, the second URL will be your domain-mapped URL. In the Application Use menu, select whichever category best suits the app’s function. We’ve opted for “Networking” in our example. For this step you’ll need an 80 x 80 px image link from an https address. You can use one from any site that has the image hosted under an https address. If you do not have one off-hand, you can upload the image to aÂ DropboxÂ account, and use the share link for this field. You’ll want to leave the permissions as default (available to anyone with the link). 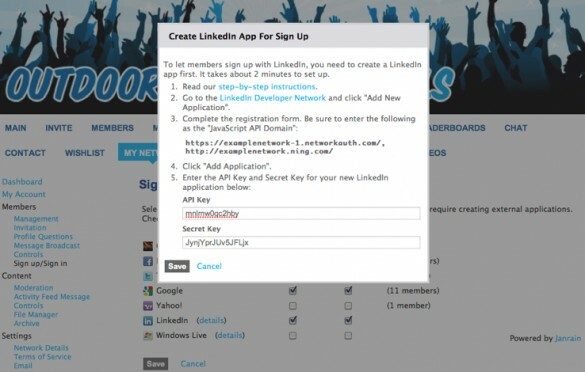 After creating your LinkedIn app, an API Key and Secret Key will automatically be generated. Copy these two fields to paste into your network. 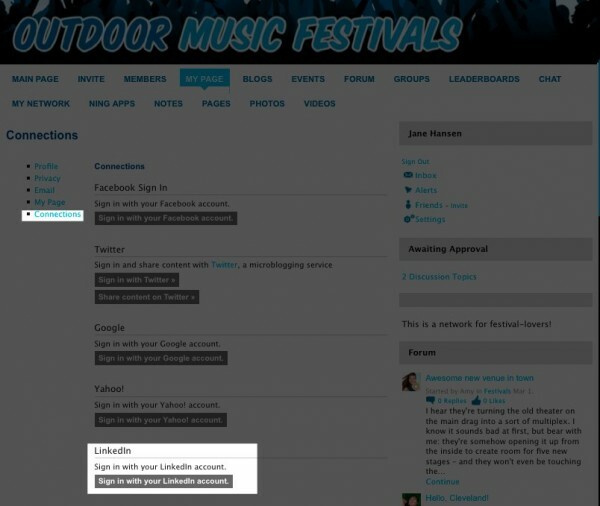 Next, go to the Sign up / Sign in page from your dashboard and click the check-boxes beside LinkedIn. Please note you can decide for each service whether youâ€™ll allow members to sign up and/ or sign in with a specific service by checking the appropriate boxes.Â A window will pop up, prompting you to create your LinkedIn app for sign up. Paste in the API Key and Secret Key that you copied from your LinkedIn app. Click “Save” in the pop-up window, then again on the Sign up/ Sign in management page, and you’re all set! After your app is all set up, your members can sign up with their LinkedIn accounts. 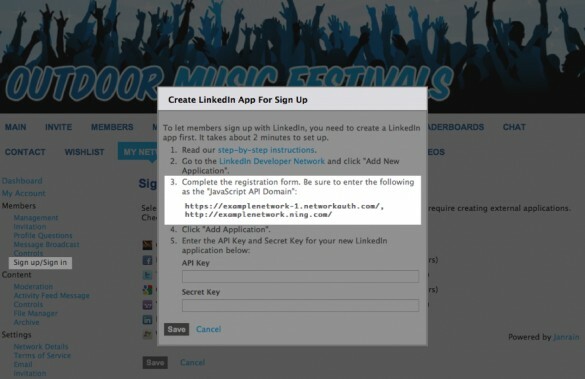 Signing up for the first time will prompt them to authorize the network to connect to their LinkedIn account. Â Please note that LinkedIn does not share usersâ€™ email addresses when they sign up with LinkedIn on any website. For this reason, members will still need to provide their email addresses when signing up. Existing members can go to their Connections page (from the Settings menu) to determine how they’d like to sign in to the network. Just click the button for the service you’d like to connect to thenÂ enter your credentials and allow Ning to access that information.Â After you do, you’ll then be redirected back to the Connections page where you’ll see your LinkedIn account now listed as active.Â You can click on that account at any time to remove the connection. 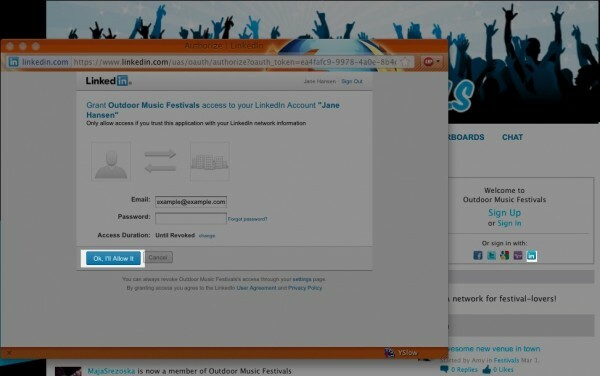 Signing up with your LinkedIn account credentials will allow us to automatically pull your photo and name from LinkedIn.